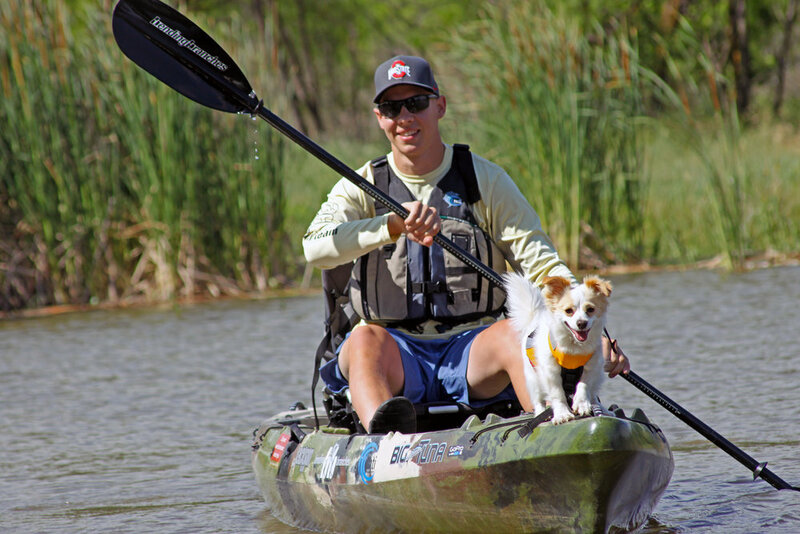 My name is Clint Taylor, owner and founder of Texas Kayak Fisher and All-Terrain. My passion to fish has always been strong ever since I got started fishing as a little boy. I started out fishing local creeks and ponds in my neighborhood when I was in elementary school. It didn't take much for me to put my line in the water, as the smallest bodies of water seemed to hold bass and panfish. It didn't matter how big the fish were, I was more than happy to catch anything. I can remember me and my dad exploring some creeks where we would nearly be swimming across to the other side of the bank just, so we could explore the stream a little more. Fishing these creeks and ponds when I was younger are some of my favorite memories and I hope to go back to some of these locations just so that I can have the opportunity to fish at the same spot where my journey began. When I reached my freshman year of high school I was still fishing local creeks, but something sparked my interest of possibly furthering my fishing tactics. I decided to invest in a canoe so that I could reach more water. I quickly fell in love with this style of fishing as I had the opportunity to fish a much broader variety of water, but I still focused on rivers and creeks. I started to catch bigger and bigger fish, partly due to fishing more often but more so because I slowly began to understand the science of fishing and became a better fisherman. I began to notice the correlation of pressure, clouds, water temperature, flow, and time of day. I really enjoyed fishing out of my canoe and tried to get on the water every chance that I could. As I reached the latter part of high school I was interested in utilizing kayaks. I research a lot of things before I buy them, but I eventually made the transition to fishing from canoes to kayaks and later incorporated paddle board fishing in the mix. Since I got my first kayak I have traveled all over Texas to fish some of the best rivers from both kayaks and paddleboards. Some of these include the Devils River, Brazos River, Guadalupe River, South Llano River, San Saba River, and San Marcos River to name a few. I have caught more fish than I could have ever imagined with quite a few monsters in the mix. I have caught many different species of fish and hope to continue fishing so that I can catch more species and even bigger fish. Although the fish really make a big part of fishing, quite possibly the number one reason I enjoy fishing so much is the time I get to spend with family and friends, the places I get to go to, and just the adventure of going somewhere you have never been before. I explore the rustic and pristine waters of Texas, with primarily rivers and creeks as my main destination. I find so much excitement from rivers that it is almost hard to explain. The sound of flowing water, the scene of rocks sticking out of the water with Texas hills and cliffs in the background, and the fish that I get to catch; all of this contributes to my passion. As you probably have inferred, I really enjoy taking the path less travelled. This is why I decided to also start “All-Terrain”, a side blog to Texas Kayak Fisher that includes articles pertaining to mountain biking, guns, camping, first aid, emergency equipment, overlanding and nearly anything that helps you travel across the awesome land God has provided us with. Many people seem to overlook the simple pleasures of life only to turn to their smartphones, televisions, or some other sort of electronic device. Who would have ever thought that a cell phone or something like social media would addict so many people? For me, being outside, whether it be kayak fishing, paddleboarding, mountain biking, or overlanding is my “cell phone”. I hope that my journeys not only give you entertainment, but more importantly inspire you to spend some time fishing and outside in some of the great rivers and landscapes Texas has to offer. I also hope I am able to provide tips and tactics for each of the individual disciplines I am involved in. I am very fortunate that God has given me so many opportunities and the physical ability to fish, bike, drive and visit so many locations in Texas and I plan on continuing to visit more and more of His creation. Never stop pursuing your passion till the day you die, always represent God and always thank God at the end of the day for the time He has given you. If you do this, the worst that could happen is that you die happy and spend eternity in a place far better than we can begin to imagine.